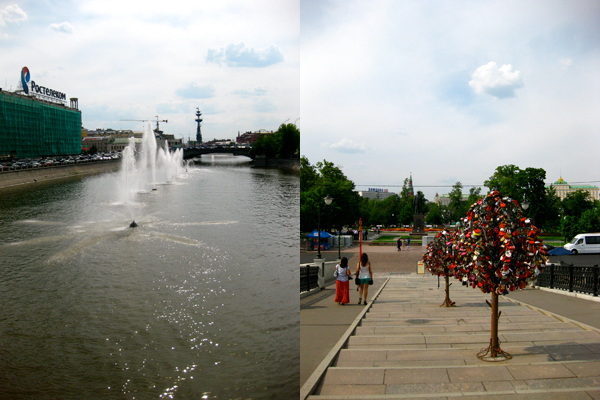 Quite recently I have visited one of my most favorite city: Moscow. I had some things to do like family visit and kind of work for something that will happen in the near future. But the most important thing is that I was accompanied by my mother. It's been a long time ago since I traveled together with my mom. She was very curious to see Moscow after almost 20 years. So I devised a program which would show her the (in my opinion) the most beautiful places of Moscow. I had more places in mind, but because we only had one week and didn't want to follow my program too strictly, we omitted some things to have a more relaxed and spontaneous time. The first place we visited was the Ryabushinski mansion or better known as the house of Gorky. 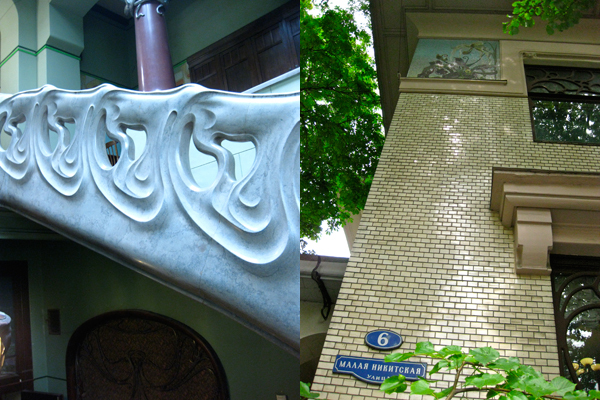 The house was built around 1900 by a popular architect Shechtel in the assignment of an art collector Ryabushinski. During the revolution the owner had to leave the country and his beautiful house which later was partly ruined. Ironically, the proletarian hero Gorky obtained this exotic house and lived there till his death in the 30's. 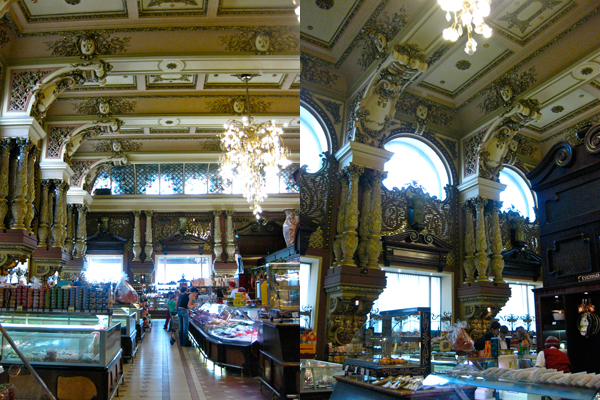 This place is worth visiting for it's rich art nouveau interior. It's absolutely never crowded and the entrance is free. Closed on monday, tuesday and last thursday of the month. Nearest metro is Pushkinskaya. If you are on the Pushkin Square, cross the road towards McDonald's, pass the fast food restaurant and keep walk straight ahead on the Bolshaya Bronnaya street until you are on the Malaya Nikitskaya street. On your right you will recognize the villa. Walk in the garden and enter. My mother really wanted to go to the Pushkin Museum next. I've been there only once before for a temporary exhibition of Modigliani. So it was definitely interesting to view the permanent collection now as well. 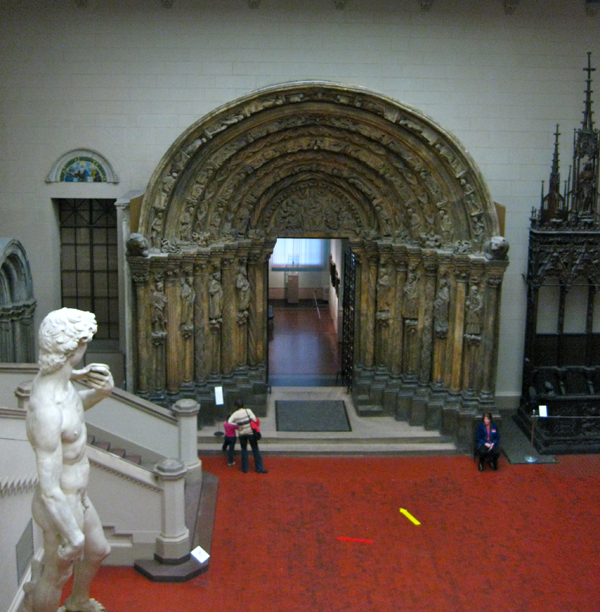 It's a small version of the Hermitage museum where also foreign art is shown. Yet the collection is quite extensive: Greek antiquities, Byzantine icons, Italian -, German -, Dutch art and French impressionists. The names you may encounter are Pieter Brueghel, Peter Paul Rubens, Rembrandt, Nicolas Poussin, Monet and much more. As I said it's not a huge museum, but big enough to spend a half day inside. Nearest metro is Kropotkinskaya. Follow the directions on the street. Be alert and move toward Pushkin Museum of Fine Arts instead of Pushkin Museum. If you're passing the Cathedral of Christ the Saviour (big church, can't miss) then you're on the right path. It was a summer day in the weekend. Many Muscovites tried to escape the busy city, but many of them went to the center. We chose the first option. To escape the crowds and traffic is not difficult in Moscow. Only a few metro stops from the center and you're in a green park full of history. Two very special parks are located near each other on the green metro line: Kolomenskoye and Tsarisyno. We chose park Kolomenskoye. I love this park, it has nature, culture, history, water, churches, view, bars. It's just an ideal place. The history of Kolomenskoye begins in the 13th century. First the refugees from Kolomna had founded a village here, which was later destroyed by the Mongols. In the 16th century Kolomenskoye became a royal summer retreat where Ivan the Terrible stayed as a child and with his first wife. I have been here couple of times before and each time I thought of the little Ivan who has walked the same paths as I just have. On an elevated terrace along the river the Church of the Ascension has once provided the background for Eisenstein's movie about Ivan the Terrible. To get there is easy. Go by metro to Kolomenskoye station. Take the exit near the front of the train, turn left in the underpass and then right at the end to surface. From there it's a short walk of about 10 minutes to the entrance of the park. The most impressive and popular tourist spot in Moscow is of course the middle point where Kremlin and Red Square are. I've been here often. I still can't get enough of this place. Whenever I am in Moscow I circle around it or I end my day somewhere in the neighborhood. Despite the crowds, it is nice here. There are many interesting sights. If it's your first time in Moscow you have to visit Kremlin. We skipped that part, yet we have used the same entrance for the Diamond Fond. I am so fortunate because every time I am in Moscow I get an invitation. I believe that the tickets are very limited, per day only a certain number of people may visit this extraordinary exposition. Diamond Fond contains the most valuable gems in Russia such as the crown of Catherine the Great and dozens of jeweled necklaces and earrings. Next to the Diamond Fond is the Armoury Palace. Several things are exhibited here: dresses, weapons, Faberge eggs, crowns and everything else what belongs to the Russian history. Unfortunately I have never been here yet, but I will definitely go to the very next time I'm in Moscow. 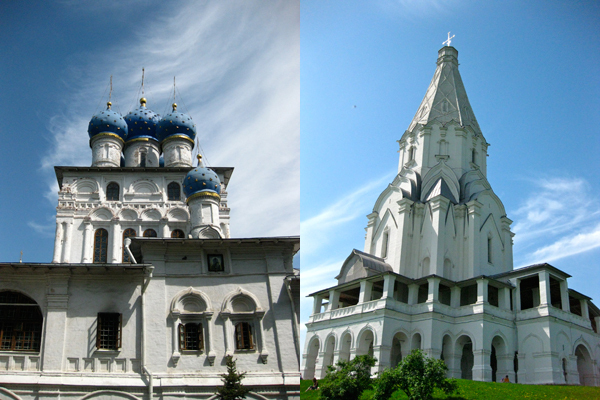 Info: Both Kremlin as these two museums are on the same territory. Tickets are best purchased at the ticket office in the Alexandrovsky garden. The entrance is at the Borovitsky gate at the end of the garden. Speaking about the Alexandrovsky garden: If the weather is nice you can relax here without having to leave the city. It's a good place to enjoy the weather and environment. There is a large shopping center nearby with pubs. So you only need to take a drink, than sit on the grass or a bench and start people watching after the active day of sightseeing. Another must is the Lenin Mausoleum. It is located on the Red Square. It's open on Tuesday, Wednesday, Thursday, Saturday and Sunday between 10:00 and 13:00. Be on time, you need to join the queue. 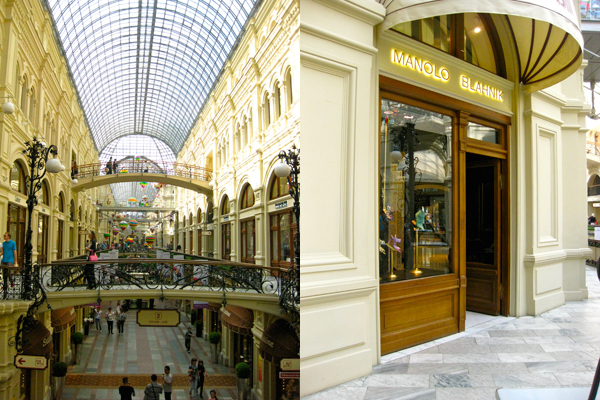 Opposite of the Mausoleum is the most famous and posh shopping center : GUM. Here you'll find numerous high end clothing shops like Moschino, Manolo Blahnik, Armani, you name it. If you have too much money, you can shop here. And otherwise you just can have a nice walk inside and view the beauty of this magnificent building. Only a few steps further is the Bolshoi Theater. Unfortunately I never had a chance to witness a performance inside. It must be wonderful though. 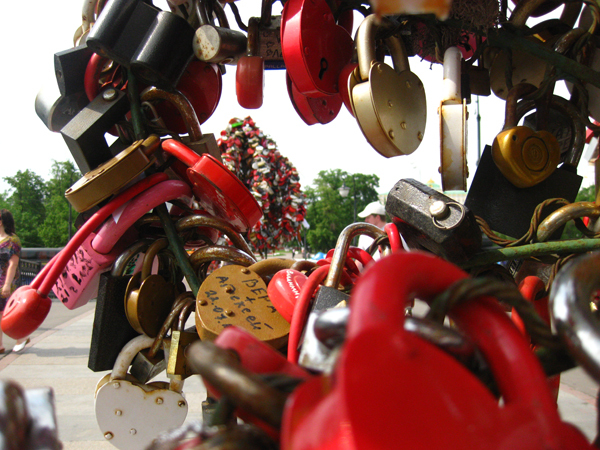 Many well known sites are very close to each other and can possibly be done in one day. Also this store is near the Red Square and worth visiting. It was the first grocery store in Moscow with a big variety of products. This building has an interesting history. Originally Eliseevskiy suppose to be a palace. But instead of that it became a salon where famous artists would meet each other. Eventually at the end of the 19th century the building was owned by Eliseev, a tradesman from St. Petersburg. And since than it is known as the posh supermarket. Surprisingly, this shop was also open during the Soviet area. But behind the beautiful counters a dark, dangerous and unfair business took place. Tverskaya Street 14. The nearest metro is Tverskaya and or Pushkinskaya. This store is within walking distance of Red Square. But if you're not in the neighborhood than it's more convenient to travel to Tverskaya or Punshkinskaya metro and walk from there. Walking along Tverskaya street is not that pleasant, it's dusty and noisy. This is another lovely place just outside the bustle of downtown. And I love spending time here. My mother had never been here so I was very excited to show it to her. The monastery is still in use. 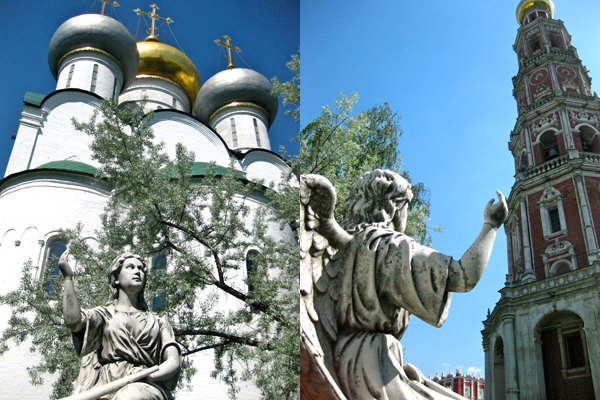 Since 1524 Novodevichy convent was home to many high-born nuns who often played a role in politics. Even Irina Godunova, the sister of the Tsar, retired here after the death of her husband. Also the first and unwanted wife of Peter the Great was confined here. Officially the convent is also a museum. Visitors can simply go inside and stroll through the territory. The entrance is free. To get here is easy. Take the metro to Sportivnaya (red line), exit at the rear of the train, turn right outside the station. Keep walking until you see the golden domes. The site of monastery is not very large. After you saw it be sure not to skip the cemetery, it lies beyond the south wall of the convent. The fascinating thing about this cemetery is that a lot of great Russian artists, writers, musicians and politicians are buried here. Only burial in the Kremlin Wall is more prestigious. It's like Père Lachaise, but Russian. 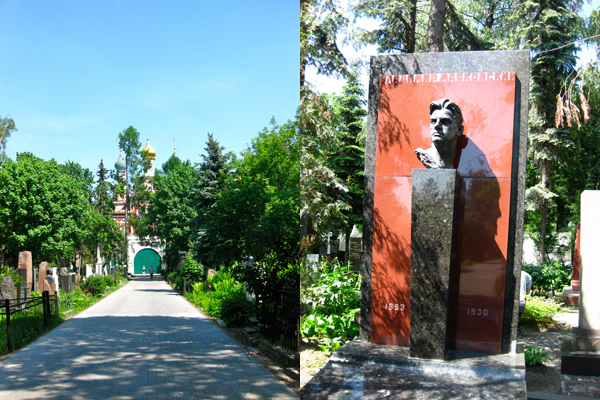 You can come across the graves of Nikolai Gogol, Anton Chekhov, Konstantin Stanislavsky, Mikhail Bulgakov, Dmitri Shostakovitch, Vladimir Mayakovski, Sergei Eisenstein, Fyodor Shaliapin, Sergei Prokofiev, Nikita Khrushchev, Raisa Gorbacheva and Boris Yeltsin. Walking here is lovely. It's very clean, green and the atmosphere is tranquil. At the entrance is a map that indicates who is buried where. It's not always easy to find all graves you want to see though. 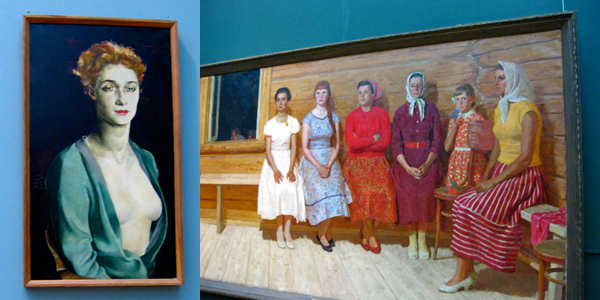 My last favorite place to visit in Moscow is not one but both sections of the Tretyakov Gallery. Here you will find the collection of many masters of Russian art. The paintings tell a lot about the developments of the art history and also the general history of Russia and her rulers. We began with the modern department which can be found on the street Krymsky Val in between the metro stations Park Kultury and Oktyabrskaya. It is better to take the Oktyabrskaya metro, from there is less far to walk. Cross the street at Gorky Park and walk to the big white building. Many people are still not familiar with this museum. Yet the art here is worth seeing. There is an enormous collection of Russian art from the 20th century: Avant-garde, Black Square of Malevich, totalitarian art and also the contemporary art. The rooms are very spacious and some offer view of the Moskva River and the not so beloved Peter the Great monument. The other gallery is a walk away from here. Otherwise you can take the metro to Tretyakovskaya. We walked along the river to the Lavrushinsky Pereulok where former house of the financier and the art collector Tretyakov is. What you can expect here is a room with icons from the Middle Ages. A big part of the museum consists portraits of the court from the 18th century. 19th century was a rich period in Russian art history. Here we see portraits of writers and composers made by influential artists. Realism of Surikov, Repin and Aivazovsky takes us to the historical events and landscapes. 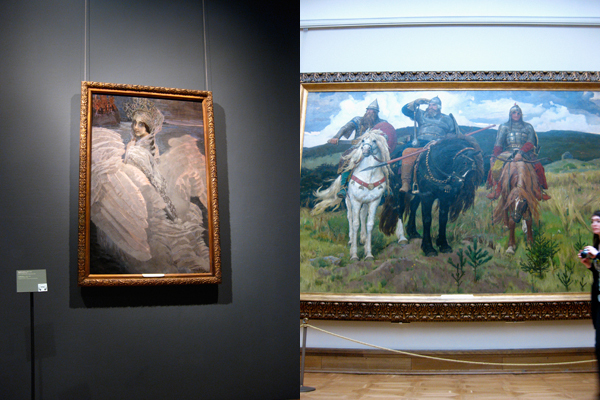 While wanderers Victor Vasnetsov and Vrubel let us enjoy the beautiful fairy tales. If you find the paintings of Vasnetsov as fabulous as I do, you should also visit the house of the painter in the north of the center. Our stay in Moscow was very pleasant. The weather was summery, so people were able to enjoy all outdoor activities. May is when the city becomes green after a long and cold winter. Half of our wonderful getaways was in the open air. We enjoyed every moment of our temporary 'La Dole Via' in Moscow. We closed our cultural days on the Kamergersky Pereulok, which is not far from the Red Square. The Chekhov Theater is also on the same street. The great thing about this street is a wide range of pavement cafes with different price category. Here you can relax, drink, eat and watch nicely dressed people pass. Thank you so much for checking out my blog! I appreciate your interest a lot! :) You don't live in Moscow anymore?